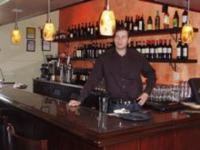 Bar Fiasco offers a variety of Italian wines as well as other California and International varietals, sparkling wines and Champagnes, beers on tap and by the bottle. With Sunset views and a spacious patio, Bar Fiasco is just steps from the Pierpont Beach at the end of Seward Avenue. To complement your drink, Bar Fiasco also offers authentic Italian cuisine from Spasso Cucina Italiana like hand made pizza and fresh calamari fritti. With a relaxed European ambiance and live music most Fridays and Saturdays, it’s easy to enjoy the good life at Bar Fiasco.